The people from moneysupermarket.com sent me an email last week telling me all about their latest 'Passion For Fashion' competition. I really liked this one and thought... Why not. I'll give it a go :) Plus I enjoy the outfit building a little too much possibly! The brief was to create 5 looks for 5 different occasion, keeping in mind the current Autumn/Winter trends. The winner of each category will get £200 to buy their outfit and an overall winner will get £1000 to spend on all 5 outfits and on top an iPad 3! LOVE. On a first date, it's stereotypically dinner, or an evening out. First impressions are everything and when I had my first date with my boyfriend, he knew I was a nutter from the moment I stepped into the car with my bright red boots. He knew I was different and I always think you should always show personality in your first date clothes so that's why I went for this look. 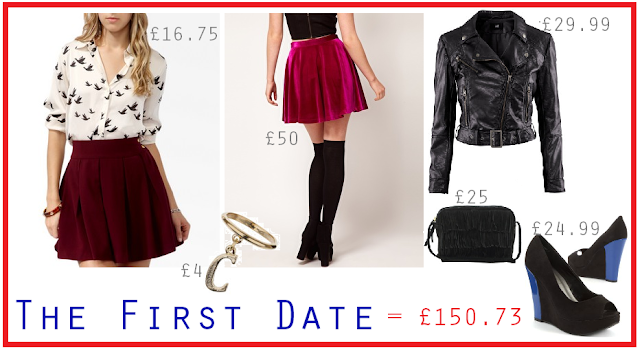 I love velvet and contrasting colours with a little girliness to it with the light blouse. Velvet is coming back this Autumn/Winter, and this Mink Pink skirt would go with so much... I think a statement piece like this is worth investing in because it's so wearable with so much. PU Biker Jackets are also on the scene right now, and would add a little attitude to this girly outfit. Clash the pink velvet with some statement wedges, light jewellery and a bag. Voila! First Date Approved! Office. I'm going to be honest, I've never worked in an office and I'm super stereorypical about what office wear looks like. BUT... If I worked in an office, I'd want to stand out from the crowd. Peplums and spike studs are in this season, which is why I went for a statement peplum top from Boohoo.com. Boohoo is so cheap and do some amazing clothes. 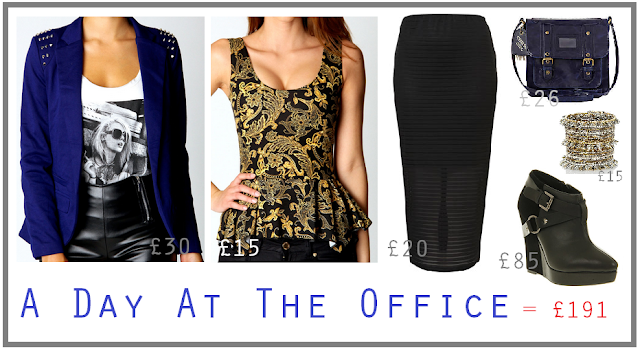 So when I saw this amazing peplum for just £15, it HAD to be the one for this look. 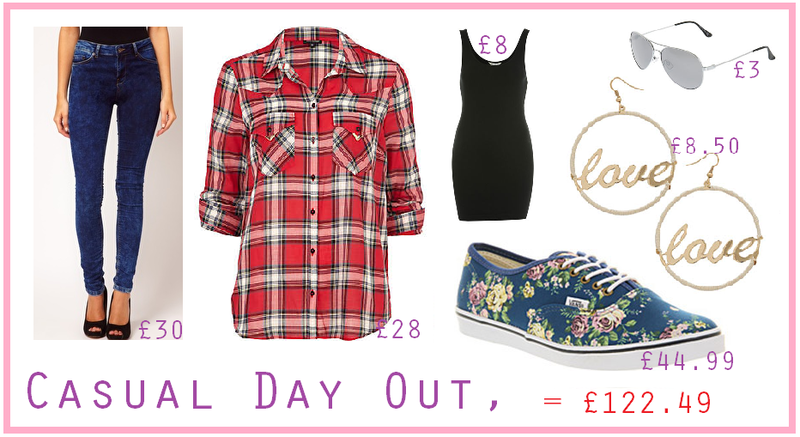 Ofcourse, pair that up with a cute ribbed pencil skirt a la Topshop and a spiked blazer also from Boohoo. I loved this electric blue blazer to go with this outfit, because with the golden yellow baroque printed peplum, it would compliment each other and create a statement look that would turn heads at the office! As always, an investment piece with some Office wedge boots, statement spiked jewellery and a cute satchel bag to finish it off! Outdoor. The cold is coming and we all know it. Not that the cold went in the first place... But with the autumn drawing in closer we're all shopping for our next winter coats. I always believe in an investment piece and this camo print jacket is it. 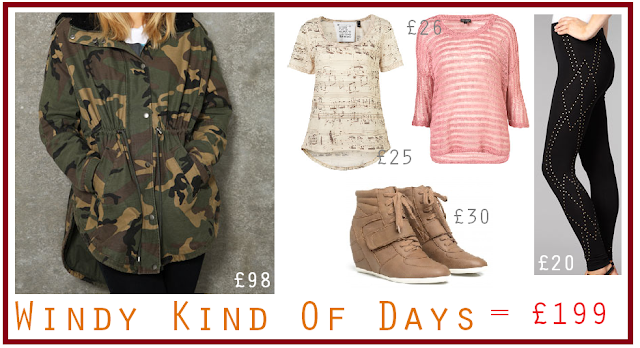 Timeless too, as it's always been a great print and who doesn't love a little army print? This jacket won me over when I saw it had a fur hood! I love a little fur to keep me warm in the cold! Layers, layers layers, before the jacket of course, a simple tee and a throw over jumper. And these Topshop basics would do the trick and work well together contrasting and giving a more feminine feel against the jacket. Pop on a pair of on trend studded leggings along with your wedge high tops and you're ready to head out! I actually really love this look... I'm just totally in love with the jacket and high tops if I'm honest. Party. I love a good night out, and what's a good night out without a little pop colour and a bodycon? I chose this amazing bodycon from Topshop, studded up in a lovely baroque pattern. I'm not much of a wearer of jackets or anything on a night out, but you're always going to need one you'll put away in the coat room. I think this Boohoo blazer with the pop pink collar would look amazing contrasting against those amazing neon yellow courts I have been eyeing up for AGES. Neon is in, and we all know it's a lot of fun, and is a great statement colour. I love putting Neons against black or grey, and just so there's not too much a suede studded clutch would go perfect to tone it down. A little pink on the nails and lips to keep on contrasting when you're blazers away and you're on the dance floor and your night is as bright as your shoes! Casual. When I think casual I think, a day in with a trip to the shops or round a friend's worthy outfit. Skinny jeans, are first on my list with pure comfort and a timeless look. No one will ever get bored of jeans. They're so wearable with so much... And with the acid wash, they're perfect this season! I've been noticing a lot of chequered shirts lately, and I really love this lumber-jack red one that I'd wear open with a simple black vest underneath. These ones from Miss Selfridge are super long - great to wear with just leggings too if you like, in LOTS of colours and 2 for £12! A perfect basic casual tpp. Clashing prints are something I've also seen all over the internet and magazines, so lightly clashing these simple vans would really make this look a winner for me. Clashing not only the prints but colours too. I'd love to tie my hair up in a messy ponytail after, and throw on some big hoops and aviators. This look wins me over because, not only is it the cheapest of the five, but it's the most effortless too! How do you like my outfits? Will you be entering this amazing comp too? Ends 24th Sept! Love these outfits! I think you did a great job. Good luck girl!